I feel like I've been talking a lot about female main characters who dress as boys to make their way in the world. So you should know by now, any story that uses this plot element goes immediately on my wishlist (and settles somewhere near the top. Don't know why, it just never gets old.) 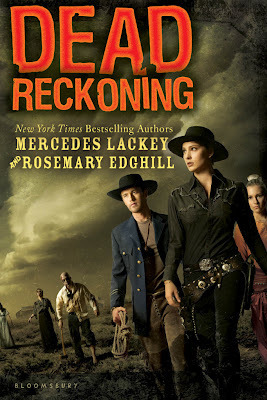 Add in steampunk, zombies and the old west, and we've got ourselves a HELLS YEAH. Oh hells yeah, indeed! Girls dressing as boys has the exact same affect on my TBR, and since I'm a lifelong Lackey fan, I MUST read this one. Hadn't heard of it yet, thanks for the heads up! Cool and bad a$$ cover. I picked up an ARC of this one at TLA last month. I can't wait to dive into this one.